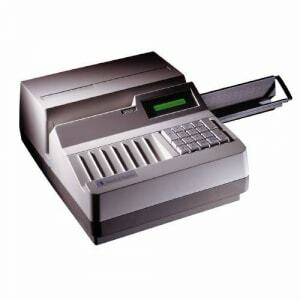 Standard Register TE1914 Exception Item Encoders it is a encoder(printer) can encode the numbers bottom of checks. This unit has key functions and it can be program with your custom needs. All the numbers are encoded with magnetic ribbon and we recommend to use original Standard Register MICR encoder ribbon for this units. Very simple key in the numbers, drop the document, and the TE1914 will encode the MICR code-line exactly to ANSI specification. Program functions directly through the keyboard, snap in a ribbon, and begin encoding with minimal operator training. Standard Register TE1914 has a footprint about the size of a piece of smal typewriter and will allow you to improve customer service by encoding items at the branch level. By encoding documents such as lobby deposits, counter checks, bonds, and repairing items for reprocessing, the TE-1914 will save valuable time and money by allowing you to present qualified items to the proof department. Unit Dimensions: 7" x 12" x 15"
7" x 12" x 15"